Firefighters were rushing to put out a fire in Flushing, Queens, when their truck collided with a vehicle, which ricocheted into another vehicle, injuring 10 people, officials said. Wale Aliyu reports. A fire truck responding to a high-rise fire in Queens sparked a three-vehicle crash on Saturday morning, hurting 10 people, the FDNY said. 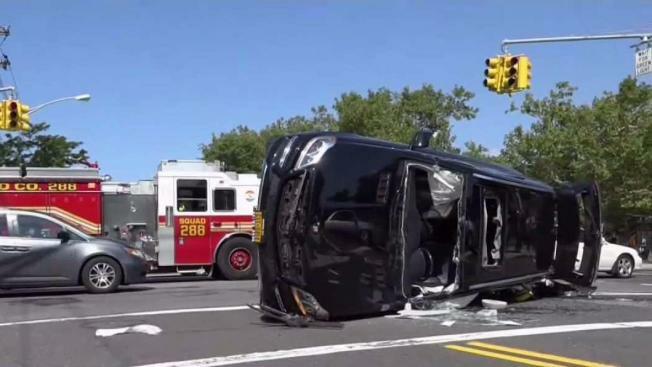 The fire truck struck a Lexus SUV, which ricocheted into a Mercedes SUV, at Kissena Boulevard and Booth Memorial Avenue, near Kissena Park in Flushing, according to officials. The fire truck was about five minutes away from the fire when the vehicles collided around 10:30 a.m., officials said. Seven people were hospitalized, including a child in serious condition. An adult was also in serious but stable condition. Three other people, including a firefighter, suffered minor injuries and were treated at the scene. Neighbors said they heard sirens, a crash, then another crash. "I looked out my window, and I see the Mercedes on its side and the fire trucks just rushing to the Mercedes trying to get the passengers out," Joel Tabernilla said. Video from the scene showed a black Mercedes-Benz GL-450 on its side on the street. Many of its windows were smashed. The fire was reported on the ninth floor of a 25-story building a few blocks from the crash site. It was put out within a half-hour, officials said.